So today I thought I'd chat a bit about the very cool crochet technique called tapestry crochet. Tapestry crochet allows you to create a piece of crochet that plays with colour changes and flat patterns. 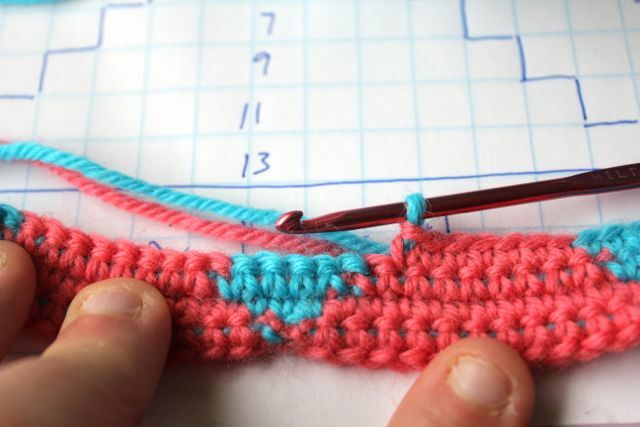 You use two coloured pieces of yarn and crochet over the colour not in use, so you can alternate between two colour as the pattern requires. 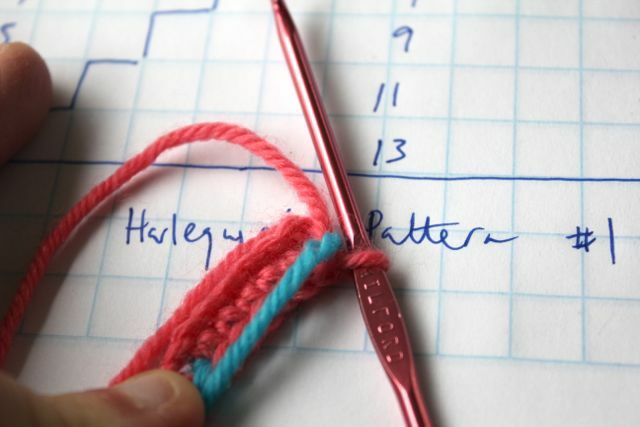 That is pretty much it in a nut shell, so if you know how to crochet, draw up a pattern on graph paper and give it a try! Tapestry crochet creates a nice thick fabric, and you can be very creative with the patterns. I am thinking of lots of things I could make using this technique! More on that later! 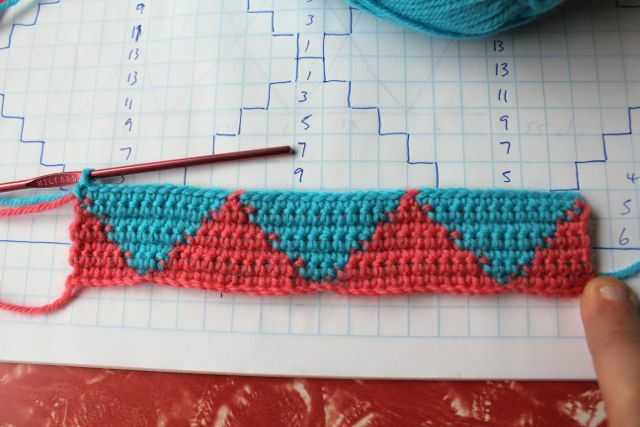 A few people asked for a pattern, so if you want a bit more detail, I have done a little tutorial and step by step guide, I hope it doesn't get too confusing. 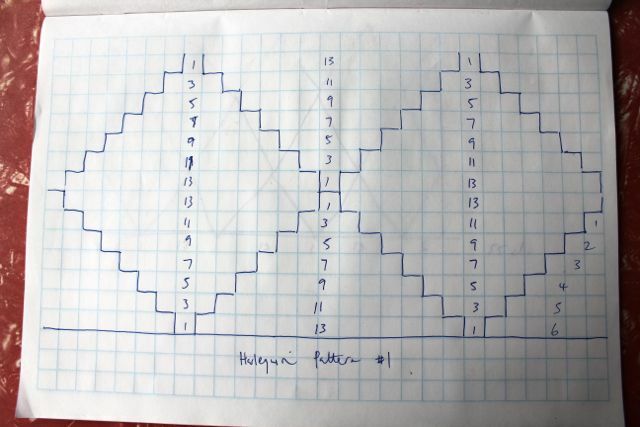 Firstly, I used graph paper to draw up my pattern, as you can see it's very simple! Each square represents 1 sc stitch. 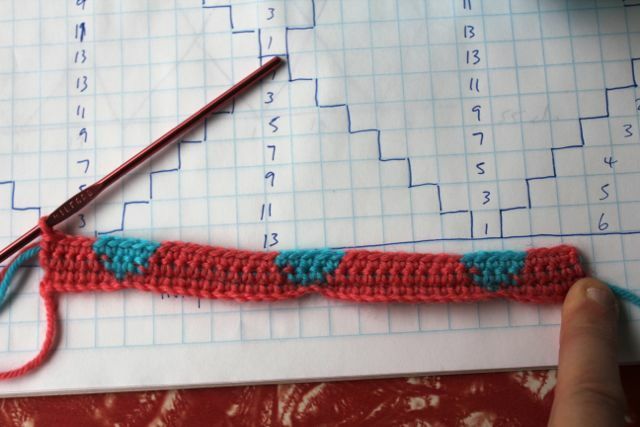 This is a repeating pattern, so you can make your piece as wide as you like depending on the number of repeats you do. 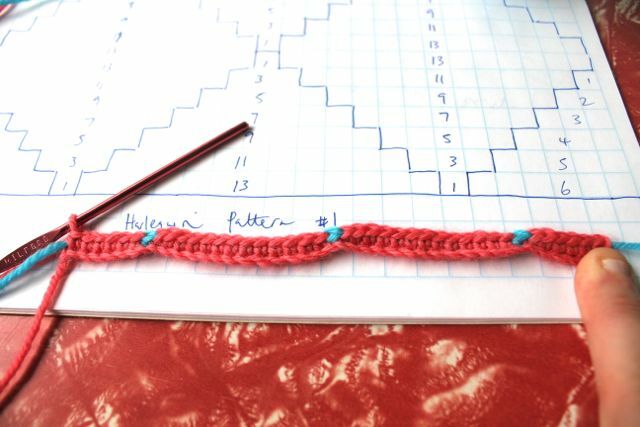 I am doing 3 repeats, so the first row of my pattern is 6, 1, 13, 1, 13, 1, 6 = 41 chains to start. So chain 41 in first colour (pink) then lay the second colour (blue) across the yarn (see above) and ch 1 in pink to trap the blue yarn in the st so it is ready to be carried along the top of the row. 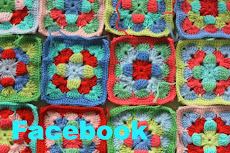 Sc the first 6 st according to the pattern going over the blue yarn, when you get to the last pink st, change to blue to complete the st, so you are ready to use blue for the next st.
ready to do a blue st! 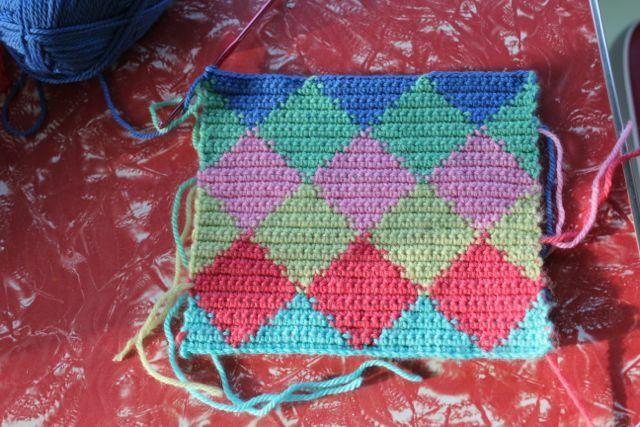 Then you continue on with 1 blue st and 13 pink st, and so on, changing colours as needed and crocheting over the unused colour. .....bring the unused colour across front of work and 1 ch in pink, then turn work and start the second row, reading the pattern from left to right for every wrong side (even numbered) row, and right to left for odd numbered front side rows. You get a nice neat edge by trapping the unused yarn at each turn. ......here is what it looks like half way through the pattern, now we just mirror the pattern that we have done to form the top half of the squares. 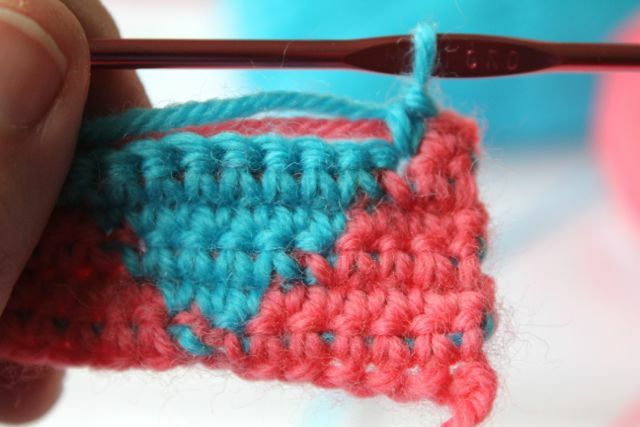 At this point you can change the pink wool to a different colour if you want to have different colours for all you rows of squares, like I have done below, or you can continue on with the pink and blue to create a checkered effect. Anyway, that's it for now, if you do have a go at this and find problems with my instructions, please let me know and I will try and fix them up. very nice! i´ll give it a try soon! Thank you for sharing!!! : I am trying to go very quickly to finish a blanket to be able to begin this lovely arlequin project!!!. I love the visual effect of this technique!!! Now I'll add it to my do list and pin to my crochet board on Pinterest!!!! Thank you for taking the time to share this technique. Your harlequin pattern looks fantastic! I can't wait to try it out. I just want to say that these are looking mind blowing thanks for the sharing and just keep up the good work. Thank you for a super tutorial!!!! wow, thank you for it, this is super! Thank you so much! I was wondering how to do this :) Great tutorial! Great tutorial - makes me want to play! You are so nice to give us the tutorial. Now, I don't have to think! This is the most wonderful tutorial! I love the look of tapestry crochet but never really knew if I was doing it right. Thank you so much! Thanks for the sharing I got many interesting things from it. WoW! What es wonderful work! Thank you so much for the Tutorial. This is fantastic - something I shall have to try sometime. Thanks for the clear explanation on how to achieve the look. I love your wonderful work and the beautiful colours you use. Whenever I try to carry yarn you can see it, am I using the wrong hook maybe? Hi Vikki. I have the same. I think it may depend on the yarn you are using. 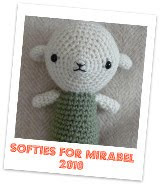 If you are using a "fluffy" yarn (by that I mean yarn that gets a bit whispy and looks more "woollie" rather than some really smooth cotton if that makes sense) than maybe you can't see it that much. May also depend on your colour changes. Really strong contrast are probably easier to notice. I do it a little differently. I drop the color and pick up the other color. sometimes have multiple colors going at one time. 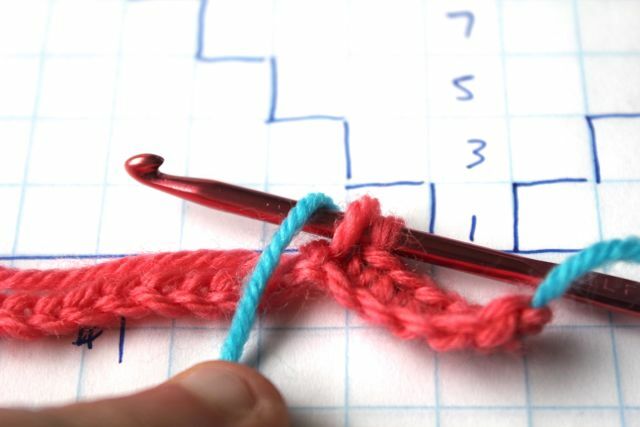 In the 5th photo down from the top where you are switching to the blue, wrap the blue yarn around the hook, AND wrap the orange yarn around the hook right behind it, drawn through both colors to complete the single crochet (or for british terminology double crochet) stitch, and now you have two active loops of yarn on your hook. 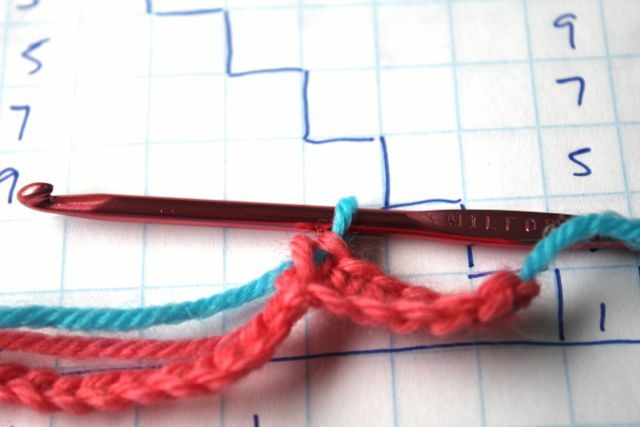 Place a safety pin or lockable stitch marker on the orange loop and continue working with the blue. 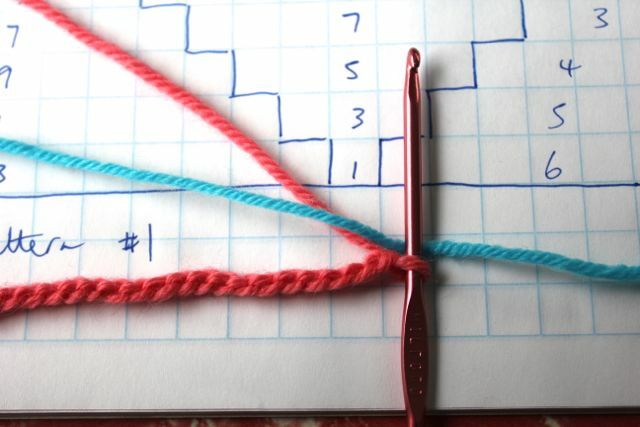 In the next row on your way back, same procedure, place the waiting orange loop on hook, wrap the blue on hook, draw both through to complete the stitch and place marker on the blue active loop. I think this makes and almost invisible transition. Oops. Didn't realize you were carrying the unused yarn along. The technique I describe requires using separate balls or bobbins for each color block but no need to carry along. 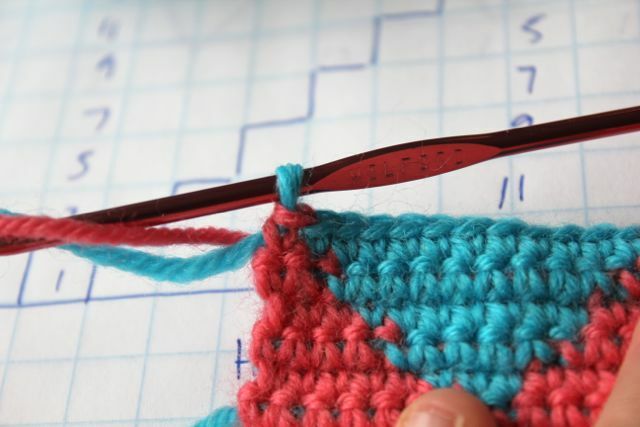 You can even use lacy or fancy stitches because there is no carrying along. 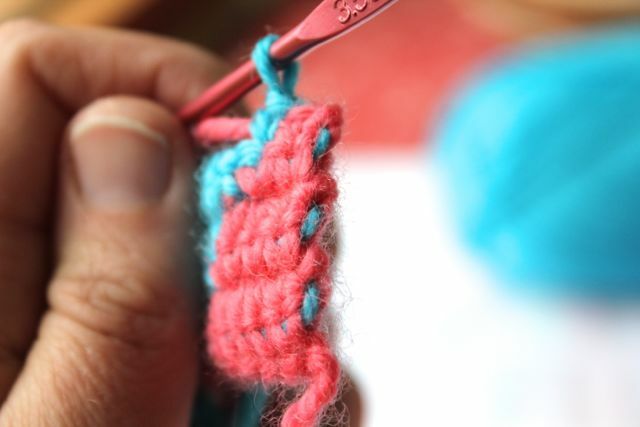 I find that's easier on my hands but not everyone wants to work with bobbins or multiple balls of yarn. Give it a try though let me know what you think. 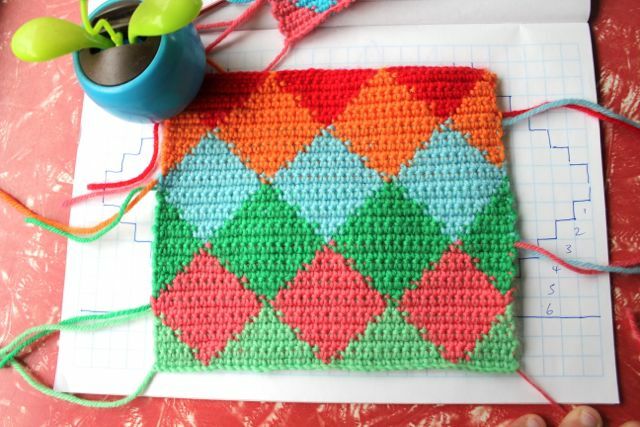 This is a magnificent tutorial....I am just learning about tapestry crochet and the possibilities for colour-play is making me hyperventilate a little!!!! Beautiful. I am slowly learning more and more crochet techniques as I am gaining in experience and, hopefully, skill. Thank you for sharing this, I'm hoping to apply it to a project very soon! Nice! Thank you for the tut! I was curious on how a chevron bag was created and this is what they used. I've just started to dabble with the tapestry technique so many possibilities. Thank you for sharing your tips & hints. 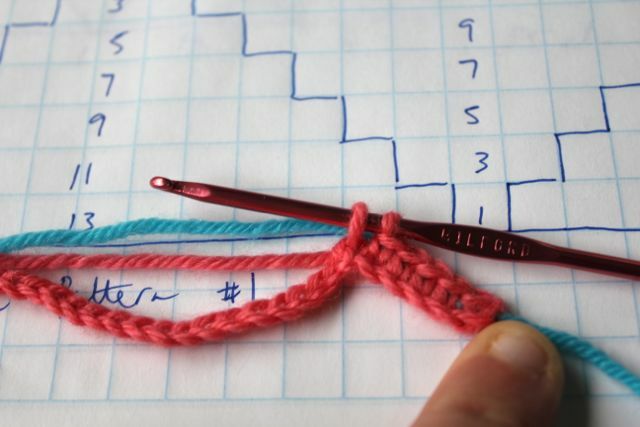 These are wonderful instructions however I need to know if this is worked with a ball of yarn and the second color just a cut string place over the working yarn. Or should I be working from two complete balls of yarn. I did the first two rows, no problem, now yarn is tugging on the third row. Please advise and Thank you. Thank you so much for your help with this pattern, I absolutely love it!!! 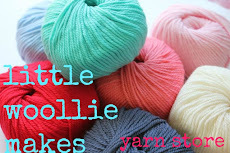 If you are using three or more different colors do you carry the yarn in the same way ? If not, how is this done? Thank you for sharing this beautiful technique. I will definitely try a project using this. Can´t wait to try your method. Thanks for sharing!! I love your blog! Thank you very much (and thank you to share with us your colorfull way of life).